"Of all the pounds I've lost and all the inches too, the best thing that's happened to me is that I've come off my antidepressants. My body simply doesn't need them anymore, because I'm finally taking care of myself properly and most importantly- feeling good about myself. I'm so happy I did Sustain and it's changed the way I eat and think about food, and I know it's making me a happy and healthier person''"
‘‘Ever since I started living on my own and cooking for myself I feel like I’ve been dieting. 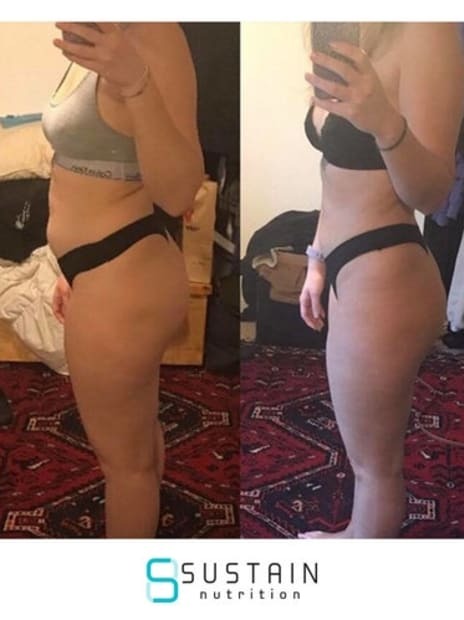 I had some brief success with slimming world, which taught me how to cook from scratch but also encouraged me to eat as much pasta, rice and low fat yogurts as I wanted which made me feel sluggish and constantly hungry. I was prescribed anti-depressants about 2 years ago, after dealing with some personal issues. I’ve always had anxiety and they seemed to help me take the edge off. After that, and after meeting my current partner, I gained roughly a stone and a half. My doctor told me it wasn’t linked to the anti-depressants so I put it down to the start of a new relationship. We all gain a little weight then, right? I began to feel hideously uncomfortable with my body and it affected my mood even more. I had my anti-depressants dosage increased and I thought if I lost some weight I’d feel better. I began yo-yo dieting, trying everything from cutting carbs completely and snacking on Atkins bars and sugar free red bulls to lowering my calories to 800 a day and binging on junk food when the hunger took over. I spoke to James Walker back in February, as I knew something had to change and I had a holiday coming up that I didn’t want to ruin by feeling bad about myself. I loved the first week I had on Sustain. I started taking packed lunches to work with my veg and chicken that I had prepped. I didn’t eat a single diet bar or fizzy drink, and by the end of the week I’d lost 4lbs. The weeks after that were similar, although as you all know- life does get in the way. The first night out I had I drunk too much and ate a McDonald’s on the way home and in the morning I didn’t just feel crap, I felt really disappointed. After that, if I was out or at a party I made conscious decisions with my food so I could have the odd drink and not completely sabotage myself. It was easier than I thought- everywhere you go you have the option of ‘naked’ burgers or swapping the chips with your steak for veg. I started to get a pretty good balance on my social life with eating well, and I was really enjoying not coming home bloated and miserable. I think the biggest change for me is skipping that Sunday morning McDonald’s binge. Overall I lost 12lbs in 12 weeks. My goal was to lose a stone but I don’t even feel like the numbers matter now. I’ve lost inches all over and I can finally fit back into my old clothes and treat myself to more! Sustain has taught me number one to listen to your body and don’t eat crap! If you’re on a diet and you’re ‘allowed’ unlimited pasta, it doesn’t mean it’s good for you! Of all the pounds I’ve lost and all the inches too, the best thing that’s happened to me is that I’ve come off my antidepressants. My body simply doesn’t need them anymore, because I’m finally taking care of myself properly and most importantly- feeling good about myself.